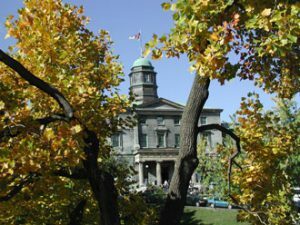 For the sixth year in a row, Maclean’s magazine has ranked McGill first in its class in its annual issue devoted to Canadian universities and published this week. McGill placed first in the medical-doctoral category, which includes 15 Canadian universities with medical schools and a broad range of PhD programs. Read more about McGill and the rankings here. If it’s beginning to sound a bit like a broken record, at least it’s a song McGillians won’t get tired of hearing. For the sixth year in a row, Maclean’s magazine has ranked McGill first in its class in its annual issue devoted to Canadian universities and published this week. McGill placed first in the medical-doctoral category, which includes 15 Canadian universities with medical schools and a broad range of PhD programs. McGill’s focus on quality, impact, and interdisciplinary collaboration has served to meet the goals of building an environment of unparalleled commitment to teaching, research and scholarship, and service to the community, Munroe-Blum said. The university was also ranked among the top 20 universities by the 2010 QS World University rankings earlier this year, and placed 35th in the THE-Thomson, underscoring a consistent reputation as one of the leading institutions of higher learning in the world. “Of most importance, however,” Munroe-Blum noted, “is that as a society we need to make education our first priority. This isn’t just about McGill; it’s about ensuring that Canada is competitive in our globalized world. The assets of a highly educated citizenry and of highly performing universities are key to a healthy society.